Sixteen-year-old Bill McDermott EMP-37, clad in a busboy uniform, was walking home from his job at an Italian restaurant when he spotted the sign: "Help Wanted," it read, hanging in the window of his local delicatessen. One full-time job sure beat three part-time jobs, McDermott thought. He strolled into the shop, introduced himself to the owner, and was hired on the spot. Within a year, McDermott purchased the shop for $7,000 in promissory notes. Then he "took it up a notch," he says, and made changes to the business that made him look like a savvy executive 30 years his senior. For instance, McDermott created a delivery service after recognizing that many of his elderly customers didn't like leaving their houses. To attract teenagers, he built a video game room and stocked it with Asteroids and Pac Man machines — a stark contrast from the 7-Eleven down the street, which only permitted four teens at a time in the store. For his blue-collar customers, "who tended to be rich when they got paid on Friday and broke by Saturday night," he created a credit system so they could shop freely. When McDermott sold the deli at age 21, he made enough money to pay off his loans from Dowling College in Long Island, N.Y., and buy his parents a beach house, where they still reside today. Although nearly 30 years have passed since those earlier entrepreneurial experiences, McDermott, a graduate of the Kellogg School's Executive MBA Program, says he still relies on those same business principles. Today, the Pennsylvania resident is president and CEO of global field operations for SAP, the world's largest business software company. Using a combination of technology, services and development resources, SAP provides businesses with solutions that reduce costs, improve performance and respond to changing business needs. The company serves small-, mid- and large-size firms in more than 25 industries. Since taking the helm at SAP in 2002, McDermott has helped the company deliver 24 consecutive quarters of significant market share gains, revenue growth and customer satisfaction improvements. Between 2002 and 2007, SAP's total revenue increased about 20 percent (accounting for inflation). 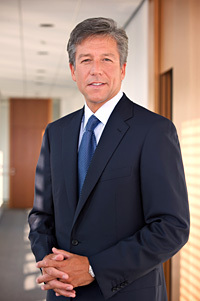 SAP also earned a spot on BusinessWeek's 2006 list of "Most Innovative Companies" and was ranked as one of the top three companies in the computer software category of FORTUNE magazine's "America's Most Admired Companies." That's no small feat: When McDermott joined the company, he was the fifth CEO of SAP Americas (SAP's North America and Latin America business units) in six years. Rather than feel like he was being set up for failure, McDermott was "extremely excited," he recalls. "I felt that SAP was one of the real treasures in the information technology industry." What the company needed, he believed, was a total management overhaul and brand new vision. Within his first 100 days, he replaced 90 percent of his executive management team with people that were "curious, interested in changing and transforming the business, and selfless in terms of dedicating themselves to the customer," he says. McDermott also redirected SAP's vision from being a product-driven company to a customer solutions and value-delivery company that is "absolutely, positively focused 100 percent on what the customer needs to win." Asked if he has any advice for today's Kellogg students, McDermott doesn't hesitate. "Never let the conditions of the moment supersede the size of your dreams," he says, alluding to the economic downturn. "In the long run, these cycles tend to work themselves out. So have a vision for who you are, what you're about and what your dreams and goals are in life ... You'll be a much better person for it."